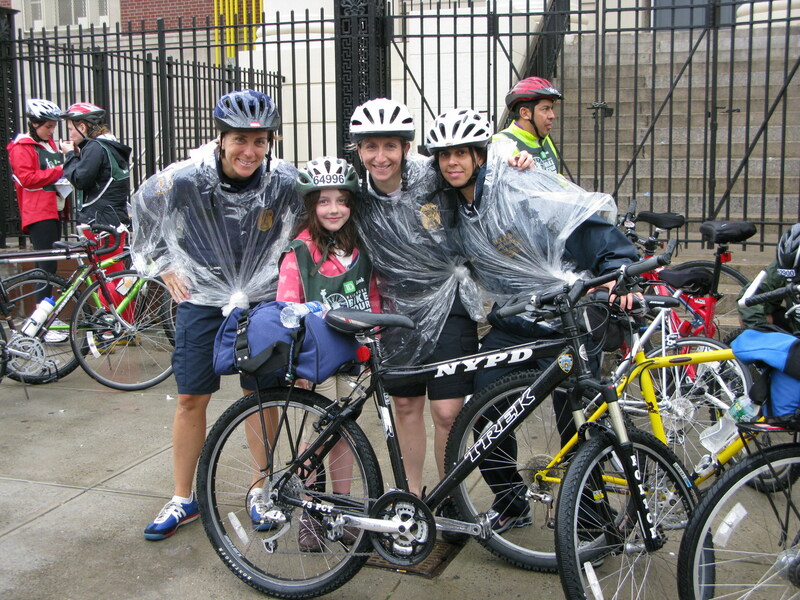 You try and raise your kids right - Minutes into the Five Boro bike ride and Emma's nabbed by NYPD. F. Scott Fitzgerald loved Manhattan. In The Great Gatsby, he described its “first wild promise of all the mystery and all the beauty in the world,” when viewed from the Queensboro Bridge. Chances are Fitzgerald wasn’t crossing the Queensboro on a bike when he wrote those words. I looked back at Manhattan over a river of bobbing bike helmets on the Queensboro Bridge and saw imposing shades of grey, the tops of skyscrapers concealed by even greyer clouds. It was Kilometre 24 of New York’s annual TD Bank Five Boro Bike Tour, a 68-kilometre celebration of car-free cycling through Manhattan, The Bronx, Queens, Brooklyn and Staten Island. The week before, temperatures hit 32 degrees Celsius. Today, the day of the big ride, the reason we’d trained together as a family, our motivation for flying almost 4,000 kilometres to New York, the mercury was barely nudging 10. 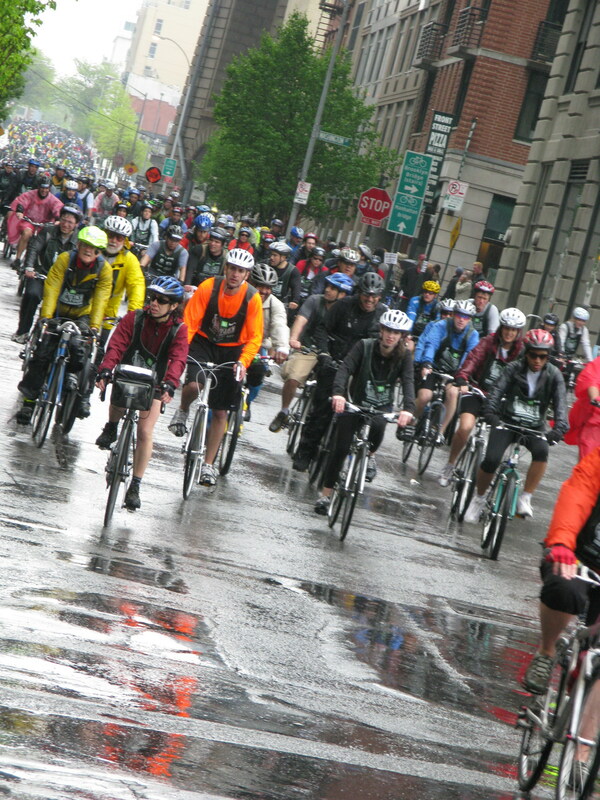 30,000 cyclists brave the rain in New York's Five Boro bike ride. “This is actually fun,” said my daughter Emma, without even a hint of sarcasm. “Really!” she added, registering my look of disbelief. Emma was clearly enjoying being the centre of attention as one of the tour’s younger participants. Soon after our 8-a.m. mass start from Battery Park and ride through the concrete canyon of Sixth Avenue, she’d been noticed by three NYPD bike cops as we snaked through Central Park. “Hey, look at that kid, she’s barely breaking a sweat!” shouted one. We seemed destined to bump into the trio throughout the day, despite the numbers of riders involved and the distance covered. Accommodating 30,000 cyclists through New York’s five boroughs and across five major bridges must be a logistical minefield. The fact that the tour has been staged annually since 1977 surely helps, but it’s only in recent years the city has begun to embrace bike culture on the other 364 days of the year. New York has expanded its urban bicycle network by 320 kilometres since 2006 while the number of New Yorkers commuting by bike has doubled in the last six In one of the busiest cities in the world, home to seven million people and 13,000 honking yellow taxi cabs, where rush hour starts at 5 a.m. and finishes about 15 hours later, riding a bike here is not as intimidating as you might think. The day before the Five-Boro Bike Tour we had rented bikes from Liberty Bicycles five blocks south of Central Park. With some trepidation we cycled our aluminum hybrids west to the Hudson River Greenway, the longest stretch of a series of bike paths that circle the island of Manhattan. While busy with walkers, joggers and inline skaters, the greenway with its dedicated lanes and traffic signals is a great place to get acclimatized to biking in New York. Crossing the Queensboro Bridge, over a century old, much loved by F. Scott Fitzgerald and made famous by Simon and Garfunkel’s 59th Street Bridge Song (Feelin’ Groovy). With the eight-lane Joe DiMaggio Highway rumbling just a few metres to our left, it felt good to be setting our own pace, gliding south along the Hudson River past waterfront tennis courts, batting cages and soccer fields, piers and playgrounds. We had little trouble navigating the older, narrower streets of Greenwich Village, where we hooked up with a two-wheeled tour conducted by Levi Zwerling and Bike The Big Apple. The company takes small groups of cyclists beyond the tourist trail through New York’s diverse neighbourhoods. Nowhere epitomized that more than the Bedford- Stuyvesant neighbourhood in Williamsburg, Brooklyn, where we cycled empty streets in eerie silence. Home to a burgeoning population of Satmar, a Hasidic movement of mostly eastern European Jews who survived World War II, this well-kept community of row houses and apartments might just be the quietest place in all of New York’s five boroughs during Saturday sabbath. Conservatively dressed families, distinguished by men wearing oversized fur hats called shtreimel, ambled along the sidewalks ignoring the less modestly clothed cyclists in their midst. By contrast, we stopped for a noisy lunch and beer-tasting at the Brooklyn Brewery, whose 150-year-old premises have been restored to their original bare brick and timber finery. Various estimates put the number of community gardens in New York at more than 600, with 10 per cent of those located in the hip East Village and Manhattan’s Lower East Side. We paused to admire one, only for two of its creators to stop by and supplement Levi’s tour with their own version. “That happens a lot in the East Village,” said Levi with a smile. 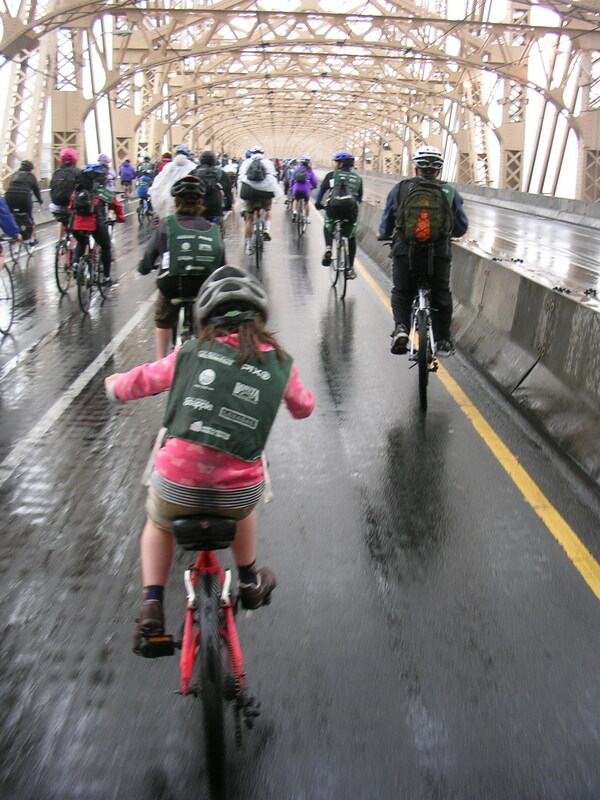 The experience helped prepare us for the Five Boro Bike Tour, which required plenty of weaving with almost 30,000 companions jockeying for space. While we passed expensivelooking Cannondales, Cervélos, Konas and Bianchis all requiring various repairs — usually flats — our trusty rentals kept us moving through the Bronx where churchgoers smiled at us in sympathy as the rain intensified. Oh, the humanity! 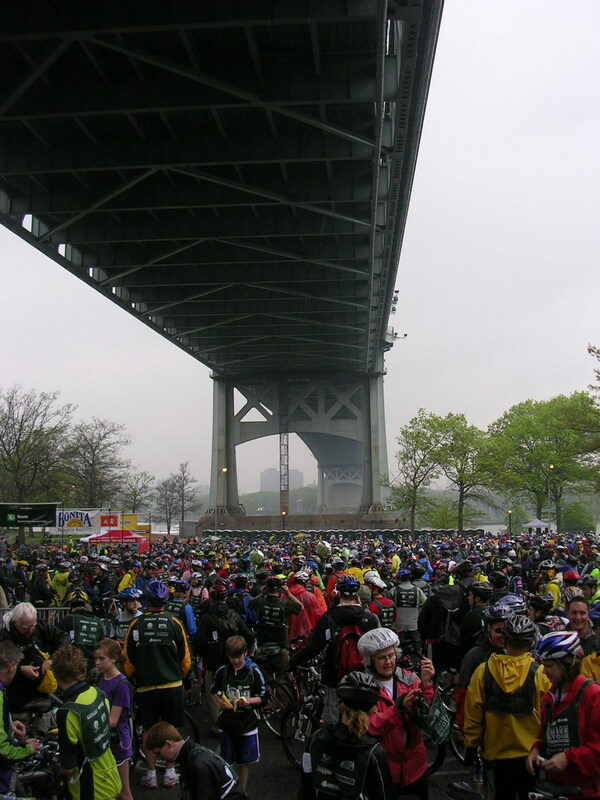 Bikers take cover under the RFK Bridge in Astoria Park during the TD Bank Five Boro Bike Tour. Quit the tour here and shortcut to our hotel for hot showers and hot food, or slog on through the deluge to the Verrazano Narrows Bridge and the finish with everyone else at Staten Island? “We’re going to come last if we stay in here all day,” said Emma, who clearly had decided on behalf of the family, much to her brother Ryan’s irritation. So it was with some pride the Judd parents watched their kids high-five each other at mid-span of the Verrazano, once the world’s largest suspension bridge and closed to bikes on all but this day of the year. Close ahead and all downhill was the finish at Staten Island. Seven hours earlier, back in Manhattan and still half asleep, we’d cycled down Broadway and through Times Square (on a designated bike lane, no less!) to the starting line at Battery Park. From here on the Verrazano, the city’s said to look spectacular on a clear day. Pelted by torrential rain and surrounded by leaden clouds, the view we got was lousy. Bike New York organizes the annual TD Bank Five Boro Bike Tour and has a wealth of information on its website (www.bikenewyork.org) for anyone planning to cycle in the Big Apple. While the Five Boro tour is the biggest event of its kind in the U.S., Bike New York also stages smaller rides throughout the year, details of which you’ll find on its website. Otherwise, to plan a twowheeled adventure in New York, visit nyc.gov/dotnews and click on “Bicyclists” on the left-hand side. There you can download or order the comprehensive New York City Cycling Map. Not only does the map illustrate the routes to ride, it also lists dozens of bike rental stores throughout New York’s five boroughs. We rented reliable adult and children’s bikes from Liberty Bicycles (libertybikesny.com or 212 757-2418) in Midtown Manhattan (9th Avenue and 55th Street). Bike The Big Apple (bikethebigapple.com or 1 877-865-0078) offers several different guided tours throughout the week and can tailor tours to suit individual requests. New York offers hundreds of hotel options, but hotels that accommodate bikes are harder to find. The Buckingham Hotel (888 511-1900), two blocks south of Central Park, is well located and bike friendly. 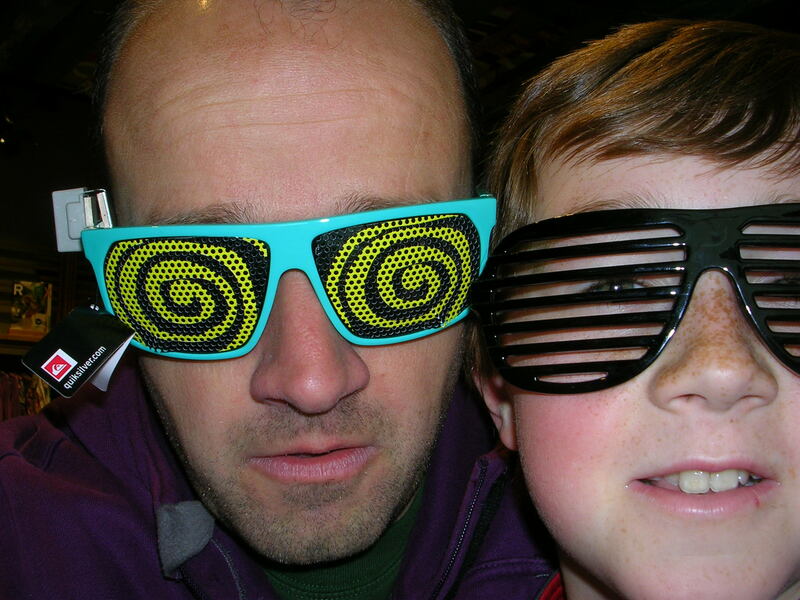 After a long, wet bike ride, nothing aids recovery quite like new sun glasses. We found New York’s subway system to be safe, reliable and relatively affordable at $2 a trip or $7 for a day-pass.While Manhattan is a great place to walk and browse, with a little planning you can easily navigate via subway between the city’s major sights. Hop-on, hop-off double-decker bus tours operated by CitySights NY (citysightsny.com) hit the highlights for $44 (adults) or $34 (children from five to 11) for a 24-hour period. Big White pops its cork for Champagne powder. Hanging by threads, suspended 60 feet up between two Douglas Firs, my mind wanders to the Okiek tribes people of Kenya. When their kids reach adolescence they are ceremonially circumcised and then secluded from adults for four to 24 weeks. Social services would probably take a dim view of that here. And it wouldn’t fly with my son Ryan, 13 today and exuding adolescence from his gravity-defying hair right down to his boxers, proudly hoisted above his gravity-defying jeans. 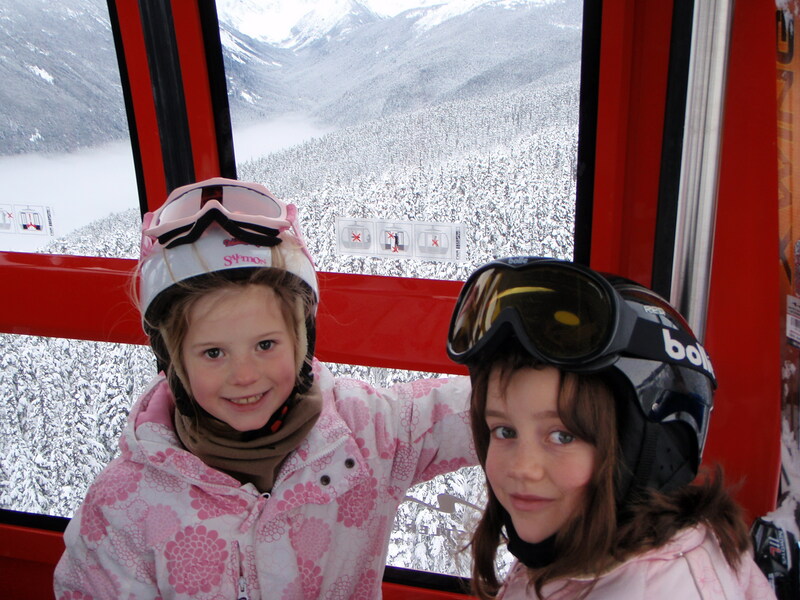 Instead we’re in Whistler with Raven and Cyrus, two of Ryan’s adolescent friends, in search of adventure. The Birthday Boy in his element. We found it yesterday on the trails of Whistler Mountain Bike Park. After turning my back on mountain biking years ago, I finally realized what I had been missing: a full-suspension bike with shocks to absorb the worst Whistler could throw at me. Our guide Mike Johnstone broke us in gently in the aptly named Easy Does It trail, advising us on the basics of braking, cornering and trail etiquette. He also chided the birthday boy for tailgating! Pretty soon we were launching our bikes into the berms of B-Line and bouncing our way down Crank It Up. And while other bikers were few and far between, we spotted eight bears — the closest all but 20 feet away. We stopped to watch the experts hurtling down A-Line, eight kilometres of drops, tables and more than 100 berms, and one of the busiest bike trails in North America, according to Johnstone. We had to talk Cyrus out of trying A-Line, but then I think we all shared a feeling of invincibility by day’s end. But that was yesterday, back when gravity was my friend. Today, hanging high above the forest floor, I’m feeling anything but invincible. “Are you OK, Dad,” asks Ryan thoughtfully from the safety of a wooden platform. “Don’t show us up,” says Raven, who’s on a fast track to walking home from Whistler. I say nothing, preferring instead to focus my energy on the task at hand: Walking across a series of spinning balls each hanging from two ropes. My two orange carabiners — a mountaineer’s best friend — are clipped on to an orange wire above me. The orange wire connects the trees, ensuring I at least won’t die on my son’s birthday should my feet slip off the balls. Orange wire is an important part of WildPlay, an outdoor playground set on Cougar Mountain, 15 minutes north of Whistler Village. Zoom Zip Lines and Monkido aerial courses make for a full day of adventure and, judging by my aching wrists and tender armpits, a full body workout. 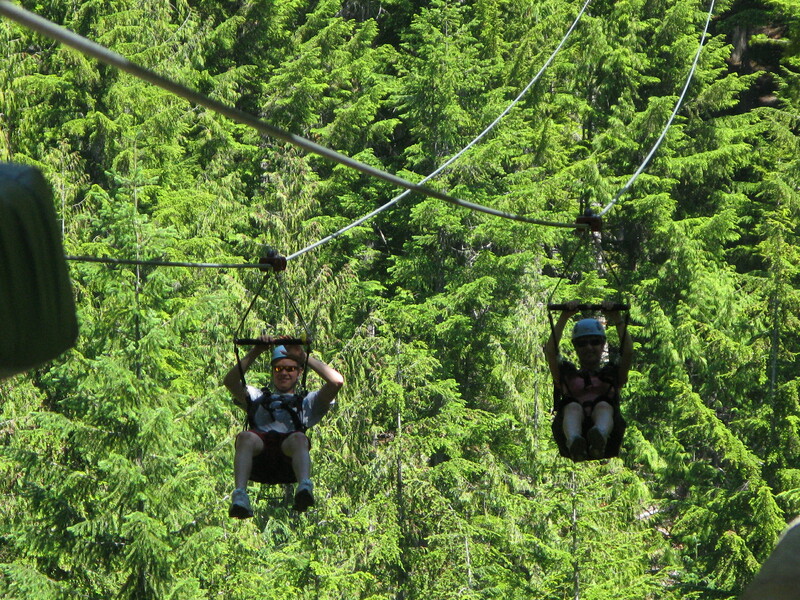 Zipliners at WildPlay reach speeds of up to 100 km/h. Monkido is an obstacle course elevated among the trees and comprises increasingly difficult challenges, from a simple tight-rope walk to Tarzan swings, mini zip-lines, scramble nets, swinging logs and those infuriating spinning balls. From platform to platform, one challenge ends and another begins, with the adventurer continuously reattaching the orange carabiners to the orange safety wire. Preservation instincts make it unlikely you’d forget to reattach, but a WildPlay guide makes sure you don’t while yelling encouragement. This doesn’t bode well. Cyrus may well have been a monkey in a previous life and has been whipping through the challenges. Through the trees I see Cyrus on his hands and knees crawling a la Spiderman on two parallel wires. “Just loop your ankles around the wires and start crawling,” our guide Katie tells me with just a hint of reassurance. There’s nowhere to look but down as I inch across, trying to ignore the strain on my knees and the sunglasses about to fall off my face. The Mission Impossible theme tune pops into my head. This must happen to Tom Cruise all the time. Mercifully it’s a short crossing. It takes about 90 minutes to complete the course and the teenage testosterone is almost palpable at the finish. The adrenaline kicks in moments later on WildPlay’s Zoom Zip Lines tour. 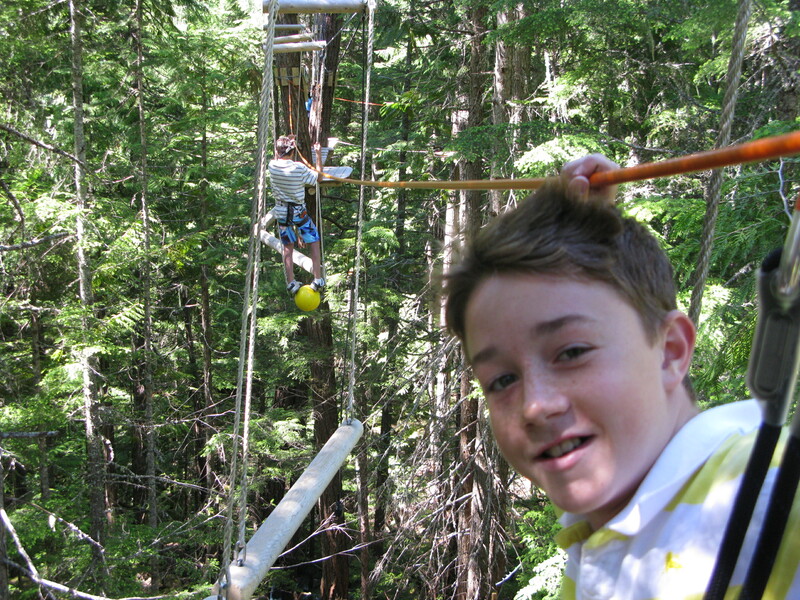 While Monkido demands physical and mental agility, zip-lining is just a flat-out thrill ride. On a course of five dual zip lines, the longest is the aptly named Godzilla. Four hundred metres up and 1,500 metres long, Godzilla spans two mountains. It descends 200 metres from start to finish, propelling riders in paragliding harnesses at speeds in excess of 100 kilometres per hour. It’s a bit like bungee jumping, but with a destination and a lot more screaming. After riding Godzilla, the boys appear momentarily speechless. “Oh my God,” offers Cyrus. “I think I may have swallowed a bug,” says Raven. “That’s the most fun thing I’ve ever done,” says Ryan. “Let’s do it again,” I think to myself. By the fifth and final ride back to base, we are pros at angling our bodies like torpedoes to maximize speed, or making like a starfish with arms and legs out to slow down. We have screamed at each other in tandem on our way down and marveled at the loud but cushioned impact on landing. At no point do any of us dwell on the fact that we have entrusted out lives to half an inch of galvanized steel and the immutable laws of physics. Well, perhaps I did a little bit. “That was the best birthday, ever,” Ryan tells me on the way home. We stayed in Whistler Creekside at Legends, which offers two-night packages, including a Peak 2 Peak sightseeing pass, for $79 per person, per night. Visit www.legendswhistler.com or call 1 866 385-0611 for details. For other accommodation deals, visit www.whistlerblackcomb.com or call 1 888 403-4727. 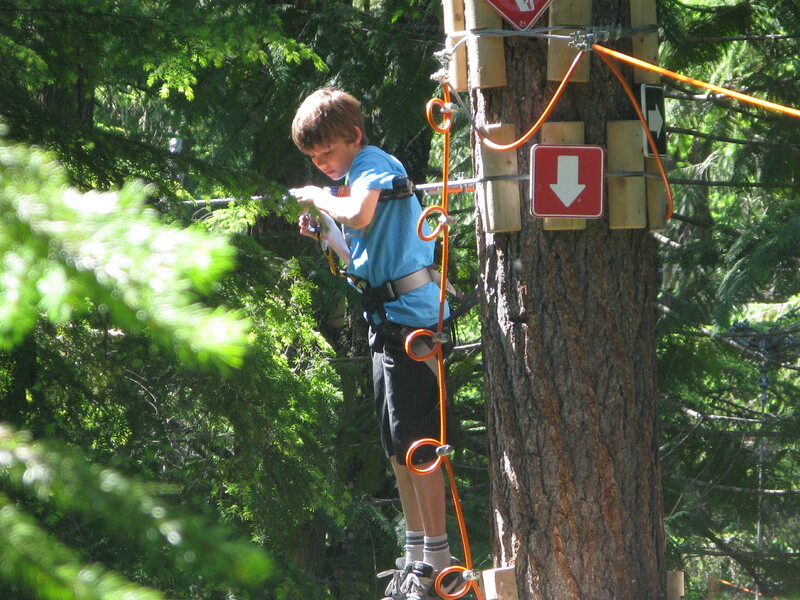 WildPlay operates parks in Whistler, Maple Ridge, Nanaimo and Victoria. 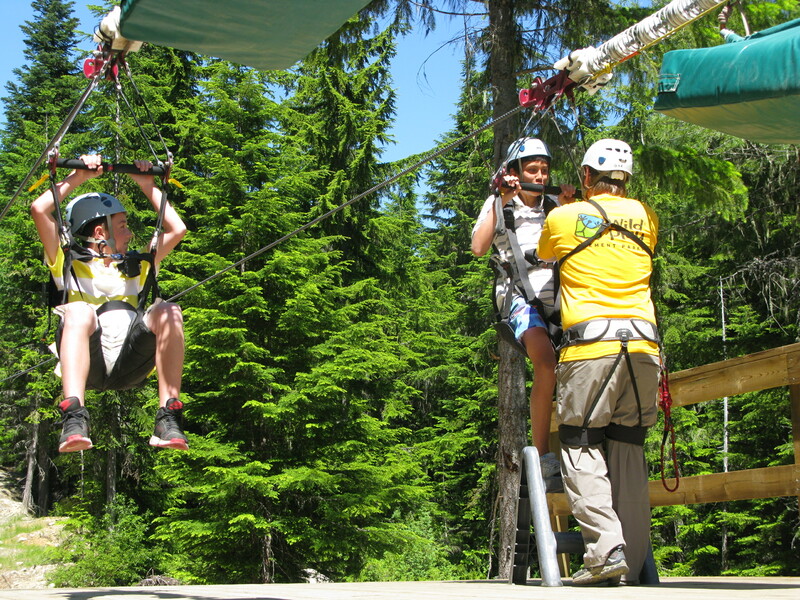 For more information, visit www.wildplay.com or call 1 888 668-7874. Whistler Mountain Bike Park offers numerous ticket deals, some of which are combined with hotel packages. Visit www.whistlerbike.com or call 1866 218-9690 for more details. The girls aren't too bothered about dangling by a steel thread 436m above Fitzsimmons Creek. Confined within a steel and glass capsule, suspended by a galvanized thread 436 metres above Fitzsimmons Creek, Whistler’s Peak 2 Peak Gondola is no place for acrophobics. Fortunately, a fear of heights tends not to afflict skiers and boarders, who’d otherwise be stuck on the bunny hills forever. In fact, judging by the hum of conversation in the cabin, our cruising altitude of 2,000-plus metres above sea level appears to concern no one. “I’m gonna have a burrito for lunch,” says the 20-something Aussie woman in front of me. “What’s in that then?” replies her male English friend. Grounded by just four towers, the Peak 2 Peak Gondola connects the top of Whistler to the top of Blackcomb — a distance of 4.4 kilometres. A man from Pemberton, sitting across from my wife, is showing off his $600 goggles, which came with prescription lenses and a de-misting fan. “You’ll never need to buy another pair,” he tells her. I do the math and realize his goggles cost more than my family of four’s second-hand skis, poles, board, boots and goggles combined. The miracle of engineering that put us here is the last thing on anyone’s minds and most passengers do not immediately appreciate the view. That could be because the journey’s so smooth, it feels a bit like we’re floating. It’s more mellow glide than thrill ride. 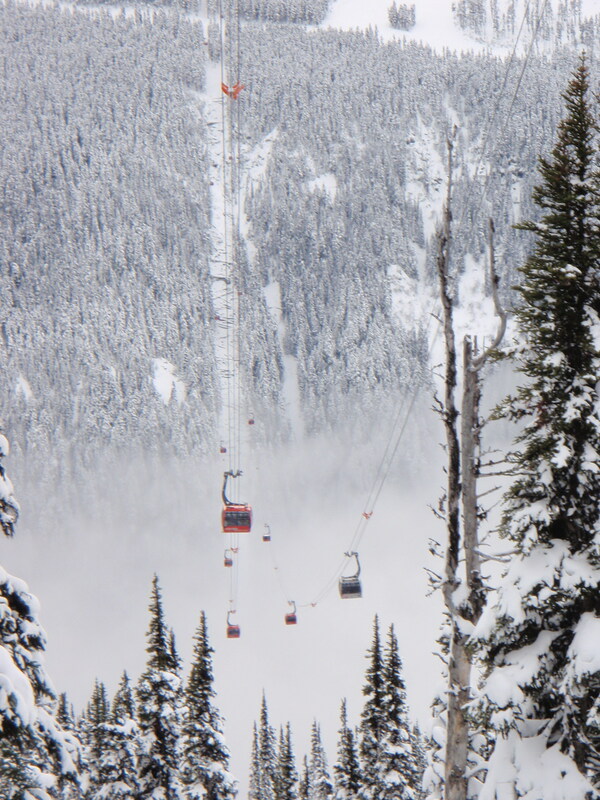 Grounded by just four towers, the Peak 2 Peak Gondola connects the top of Whistler to the top of Blackcomb — a distance of 4.4 kilometres. Three kilometres of that distance dangles between two of the towers, making this the world’s longest unsupported span for a lift of this kind. It’s also the highest. Smythe was skiing in Zermatt, Switzerland, in February 1997. An idea took shape while looking down at the vast expanses between peaks as he flew above the resort in a helicopter. “I said, ‘Gee, we could connect Whistler to Blackcomb,” recalls Smythe. In 11 minutes, the Peak 2 Peak does what used to take skiers like me half a day to do. When the $52-million Doppelmayr-type lift opened two years ago, I wasn’t initially thrilled. I’d always been fond of clumsily working my way down Whiskey Jack and Olympic runs from Whistler’s Roundhouse to ride Excalibur and Excelerator up Blackcomb. Admittedly, I’m the kind of person who longs for the days when keys, not swipe cards, opened hotel room doors, and when people raked leaves instead of blowing them, but really, must everything be sacrificed for the sake of time and convenience? Then, on our first evening in Whistler earlier this month, I got talking to Stu from Utah in the hotel hot tub. Funny, I thought to myself. I’d never considered that. Other unexpected benefits became obvious the next day when we finally boarded the Peak 2 Peak on Whistler. Our modest party of 14, including six children, had spent much of the morning arranging meeting points by cell phone after becoming split up on runs or in lineups for chairlifts. After finally assembling at The Roundhouse Lodge, we moved next door to the Peak 2 Peak Gondola. The lift’s 28 cabins each hold 28 people (24 seated and four standing). Two cabins are built with glass bottoms, reducing capacity. Fitting 14 people isn’t exactly a squeeze, and with a cabin departing every 49 seconds, lineups are minimal. Each of the lift’s 28 cabins have room for 28 people to get cozy (24 seated and four standing). 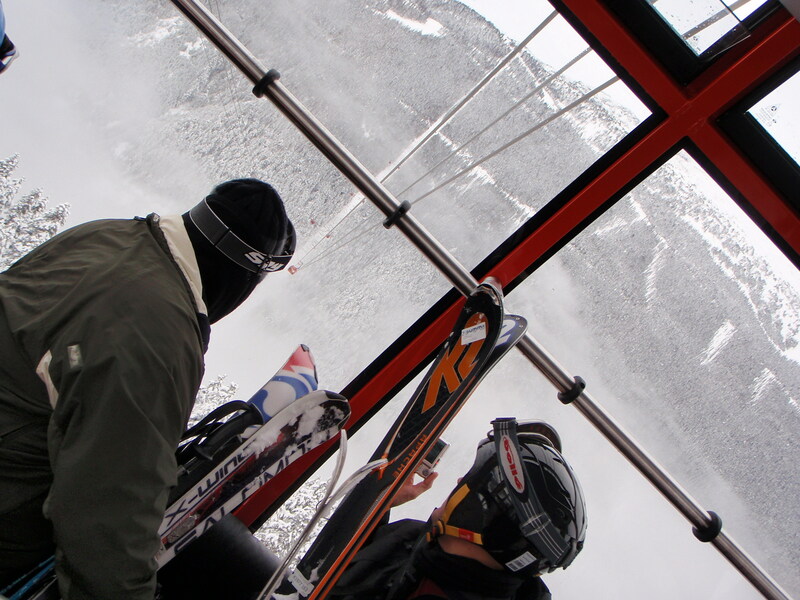 The day we first boarded, it was Whistler village that was socked in, leaving us to glide across a valley floor coated in cotton candy-like mist. To the east soared the peaks and bowls of Garibaldi Provincial Park. Below, the meandering black streak of Fitzsimmons Creek was just visible through the cloud. And then skiers and boarders on Blackcomb’s upper runs came into view. “Look at the ants, Dad, look at the ants,” said my daughter Emma, excitedly. Navigating black runs and occasionally dropping off into the trees, they might have been pine beetles on planks from where we watched. Disembarking on Blackcomb, we paused to take group photos by the lift station before, inevitably, getting split up during the descent of Blackcomb. The next day, I was back taking advantage of the fast track in the sky. The lower slopes were icy and fogged in. From mid-station up blue skies heralded an inversion that blessed both peaks with temperatures well above freezing. But which peak to choose? It only took 11 minutes to figure out. The Ancient Order of Froth Blowers liked to party. Fond of singing and loud spontaneous toasts, this motley collection of community-minded drinkers frequented numerous pubs around the British coastal resort of Brighton in the 1920s. My brother Trevor calls to order another meeting of Book Club. And although “lubrication in moderation” was the group’s rallying cry, it eventually succumbed to the moral pressure of the temperance movement and the economic reality of the Depression. My brother Trevor has lived in Brighton for about 20 years. His loosely affiliated group is called Book Club. Not quite ancient, but usually orderly, the club comprises men whose wives attend a book club. On the ladies’ book club nights, their husbands meet at a pub. They have about 300 pubs to choose from these days. The oldest, the Black Lion, started life as a brewery about 450 years ago. Its founder, a Flemish Protestant brewer named Deryck Carver, was later burned at the stake in a beer barrel for this faith. 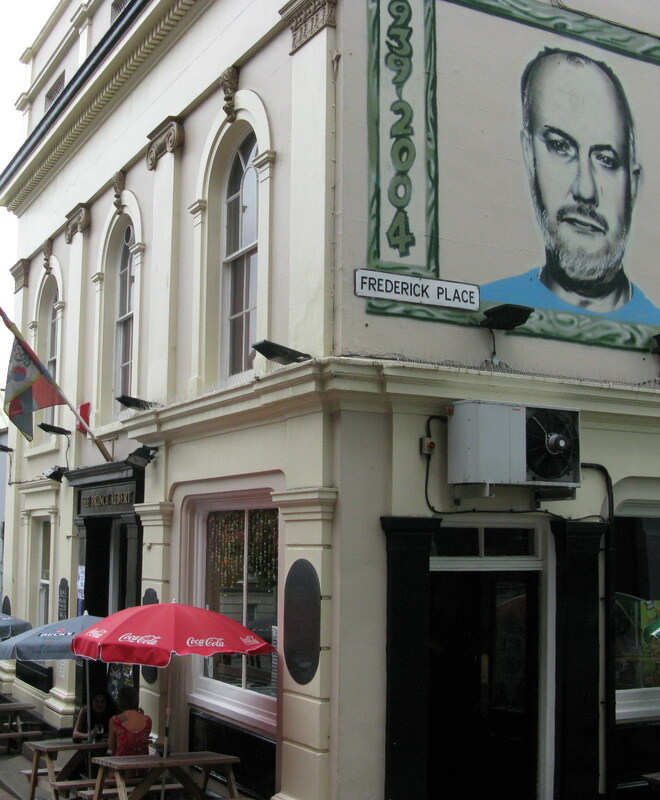 John Peel adorns the exterior of The Albert in Brighton. The religious authorities had loosened up a bit by the time the Prince of Wales began visiting in the late 18th Century. Inns sprang up to cater to the increased stagecoach trade and wealthy Londoners flocked to the fashionable resort for its supposedly curative seawater, which was piped into bathtubs in waterfront hotels. Now visitors come for Brighton’s dynamic cultural scene, much of which begins and ends in the city’s pubs. Whether they’re serving from former churches, converted warehouses or transformed Georgian living rooms, pubs provide a unique perspective on Brighton’s history and culture. To document a pint-sized snapshot of Brighton’s pub scene might prove to be a tall order. But with lubrication in moderation in mind, I set off with the Book Club on a perfect summer evening in July. Pubs had been carefully chosen to be no more than four minutes walk apart; some quiet, some noisy and all with great beers. 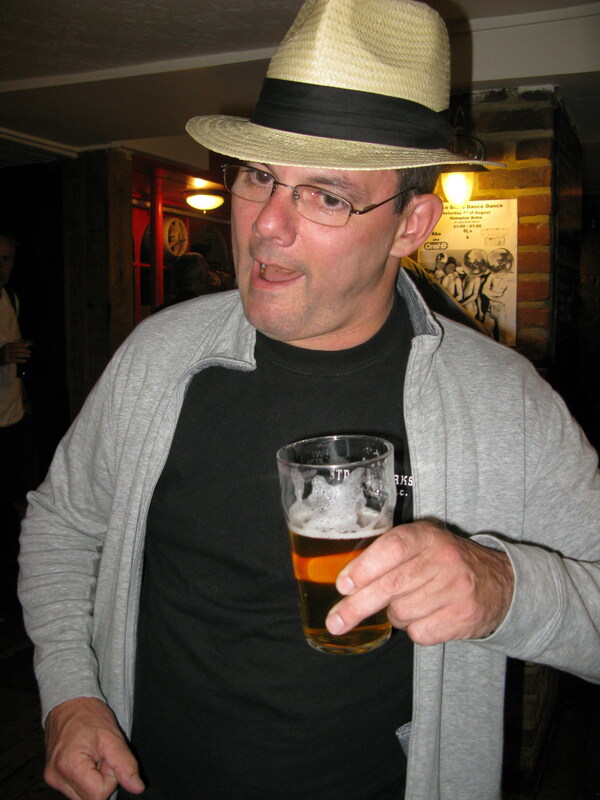 Our entourage included Geoff, who was infamously banned from a pub in neighbouring Hove for pointing out to sensitive bar staff that he had been under-charged. Besides myself there’s also a couple of honourary Book Club members: My friend Neil, a diabetic, who insists that cider actually lowers his blood sugar level; and my other brother Keith, a Crohn’s sufferer who should probably be at home with a good book. Our journey starts at The Battle of Trafalgar, just uphill from Brighton’s railway station, on the edge of a maze of Georgian terraced houses. We settle in over pints of locally brewed Harvey’s Best. It feels a bit like we’re in someone’s living room, despite the presence of “Rebel Control”, an ominously named band setting up by the fireplace. London commuters who can afford the half-a-million pound price tag for a few hundred square feet of floor space tend to live here now. Pubs have had to diversify to survive. The Sussex Yeoman across the street, for instance, is a gastro pub specializing in sit-down meals. None of us are ready for baked Camembert or stuffed trout so we proceed to the Duke of Wellington. 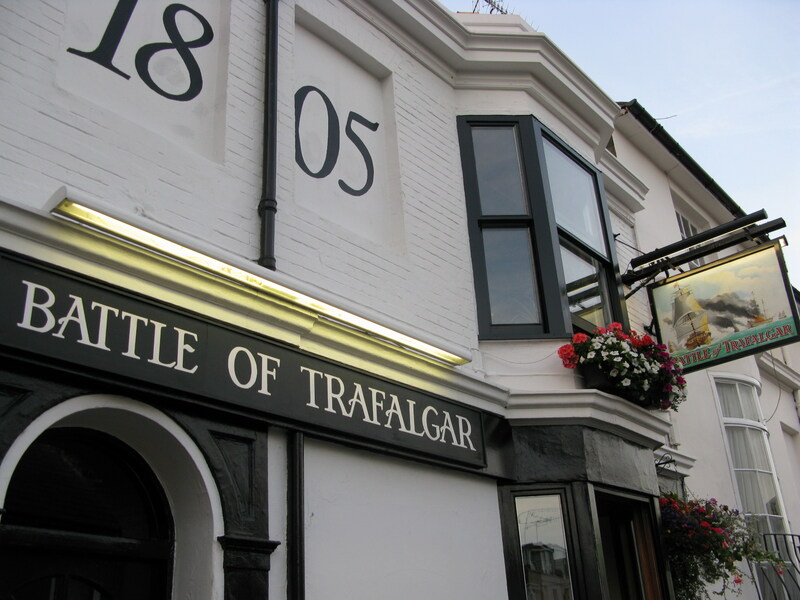 You'll find the Battle Of Trafalgar still raging in Brighton. Bob Dylan’s on the jukebox and the Christmas lights look conspicuous amid the bar stools and high tables. I consult my Definitive Guide of Brighton’s Best Pubs for its assessment of the Duke. Things liven up at the Caxton Arms, which is full of students. They don’t appear to be there for the books shelved floor-to-ceiling along the walls. Amid the library setting a bout of spontaneous dancing breaks out. The Specials, a UK ska band hugely popular in the late 70s, are booming out Monkey Man over the sound system and others take to what little floor-space is left. We all calm down a little at The Basketmakers Arms, “possibly the best pub in Brighton,” according to the Definitive Guide. Beneath eight-foot ceilings are walls chock full of trinkets such as cigarette cases, biscuit (cookie) tins, business cards circa 1920. “Yes, I always use Thompson’s Manures,” proclaims an old poster next to a framed Hank Williams picture. Mussels cooked in cider are on the menu, but we stick with locally brewed Gales Seafarers Ale. Such is the cross-section of clientele — from ESL students to old men with canes — the mood inside The Basketmakers feels like a family party. I’m beginning to think I could happily spend the rest of the evening here (if not my life) when Trevor orders us onwards. A glance at the free Brighton What’s On guide reveals legendary Brighton band The Long Tall Texans are playing at The Prince Albert. According to Trevor, there’s time for two more pubs before catching the show. You'll never be caught short at The Pond. 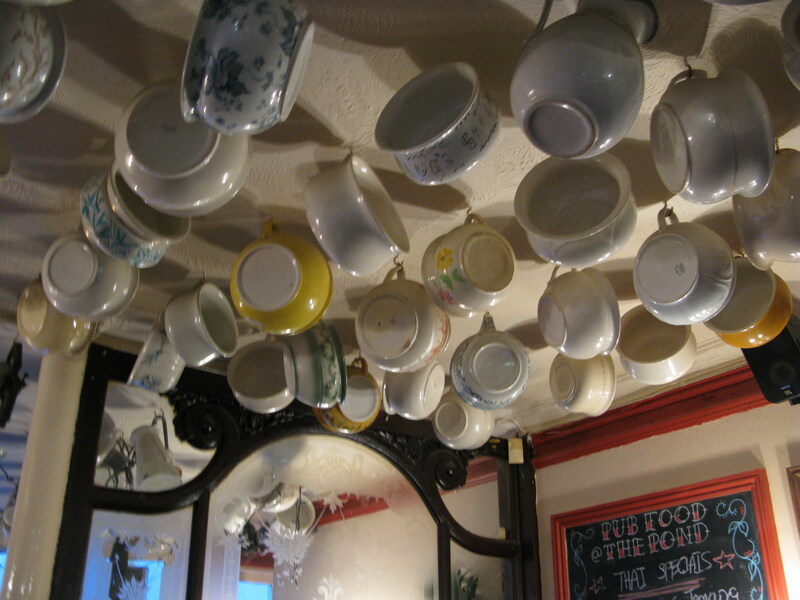 At The Pond it’s hard to miss more than a hundred porcelain chamber pots hanging from the ceiling. Once kept under beds for emergencies in Victorian times, the pots make a low ceiling feel lower and induce several trips to the bathroom. We leave for The Evening Star, one of only two microbreweries left in Brighton from the 10 that thrived here in the late 19th century. 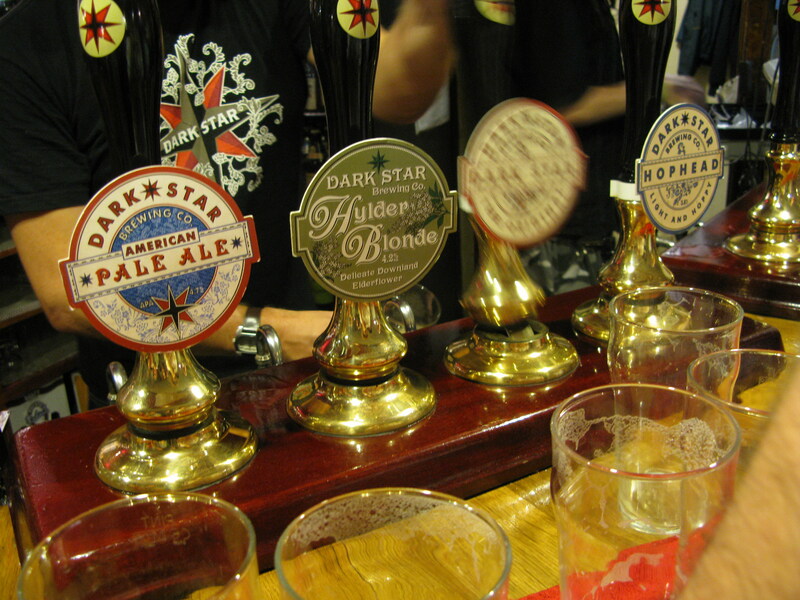 The pub’s more interesting brews include an Espresso Stout and Delhi Beli, a tandoori curry-flavoured beer. I order the latter but the din of conversation is so deafening I get a Dark Star Pale Ale instead. It’s probably for the best. We join crowds of drinkers gathered around picnic tables outside on the sidewalk where conversation becomes audible and somewhat more coherent again. 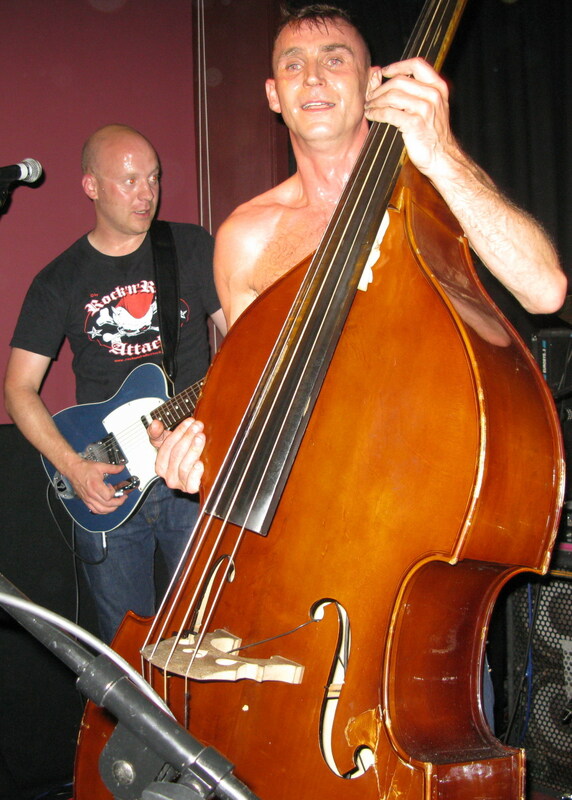 Later still, the same cannot be said upstairs at The Prince Albert where “psychobilly” band The Long Tall Texans are presiding over a writhing, sweaty mosh pit of mostly middle-aged men. A cozy night in with Mark Carew of The Long Tall Texans. The Prince Albert’s owner Chris Steward used to run Brighton’s foremost music venue, the Concorde, where the late Amy Winehouse started out and bands such as Martha and the Vandellas make their comeback. Steward took over the Prince Albert a few years ago, providing its first lick of paint in 47 years as part of a £100,000 facelift. Olli thinks for a while. “We’ve got a Metallica tribute band coming on the 24th,” he tells me. Just as I’m contemplating such weirdness, I’m distracted by something infinitely more strange propping up the bar. 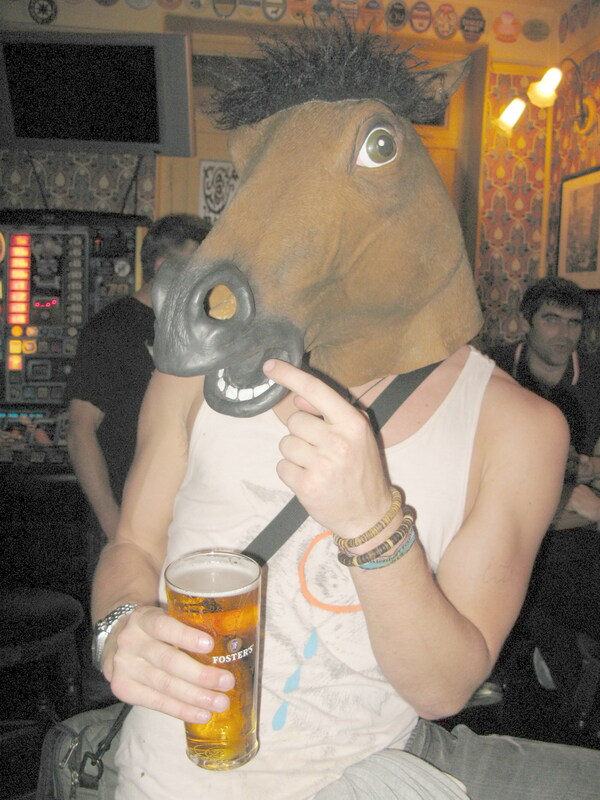 It’s close to last orders now and among the revelers downing the last of their pints is a man wearing a latex horse’s head. The fact that he’s alone and actually drinking through the horse’s mouth appears to bother no one. “If it’s weird, it’s here,” Trevor says with a smile. Guilt and my own two legs prevented me from renting a mule at the Grand Canyon. At Pima Point, on the Grand Canyon’s south rim, they say you can hear the Colorado River a mile below. It might have been the breeze or the din of countless unfinished conversations in the air, but we couldn’t hear it. First sight of the Grand Canyon tends to cut conversation short. “Whoa …” said my son, Ryan. “Holy …” said my wife, Leah. “That’s a mighty big ditch,” said a man nearby in a deep Texan drawl. We had come by train from Williams, 100 kilometres away. The local historical society had staged a Wild West shootout before our departure. A Navajo singer had serenaded us on board. And the dusty desert flats passing our windows had lulled us into a midday doze. Perhaps that’s what added to the spectacle. It’s not until the last minute that the Grand Canyon reveals itself. Set against such an epic backdrop the sky seems only more infinite. And it’s just as well there’s so much room on the rim because tourists like us are everywhere. 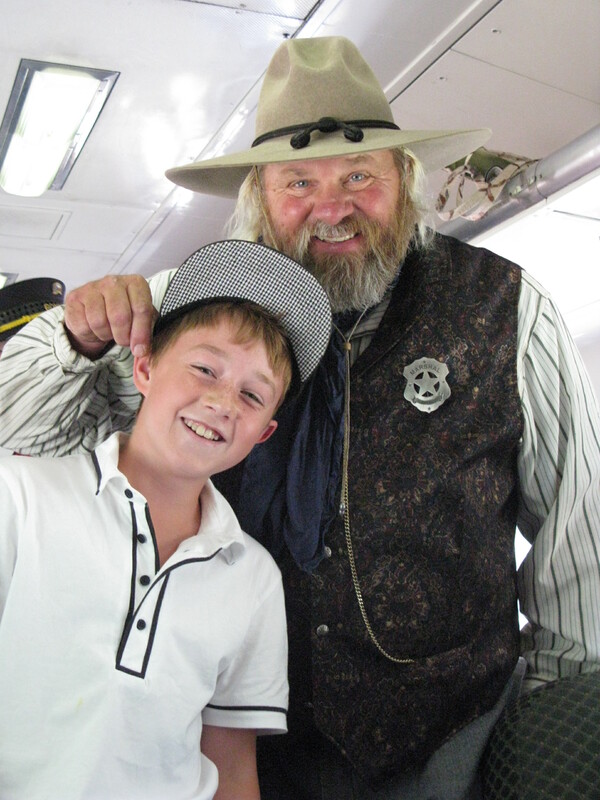 Ryan's nabbed by a wild west outlaw for looking too cute. 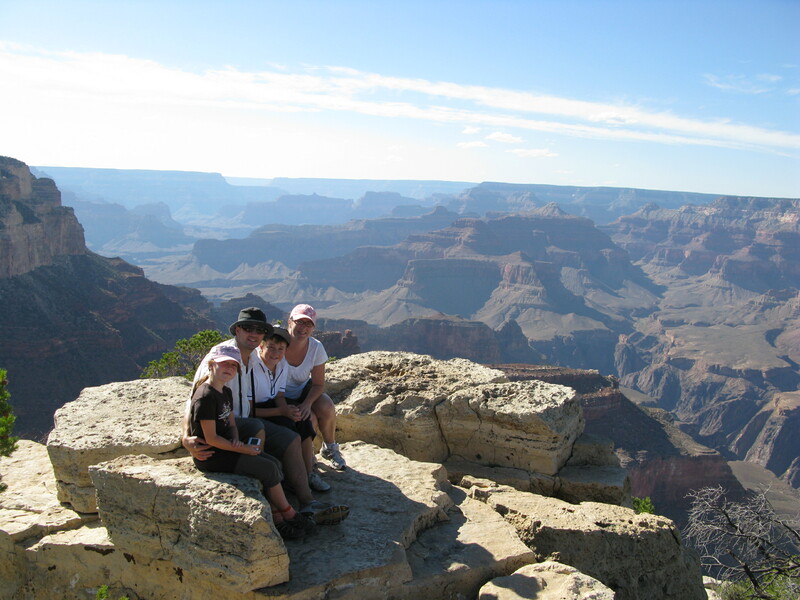 Fortunately, the Grand Canyon, like Arizona, is big enough to absorb the crowds. Better yet, it’s cooler than the cauldron of Phoenix, where we’d arrived and rented a car a few days before. 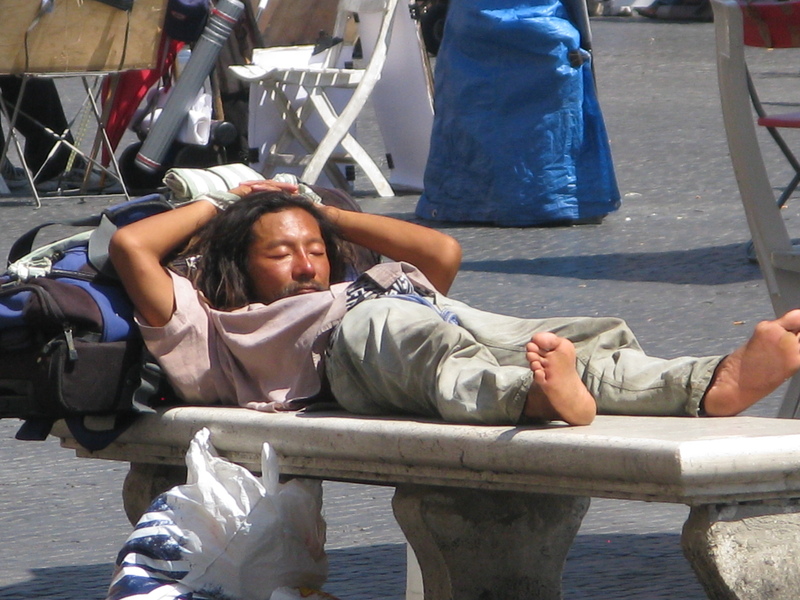 It had been 45 degrees Celsius (113 Fahrenheit) and even the locals were complaining. “It makes you wonder who showed up here all those years ago and thought, ‘Hmm, this looks like a good place to settle,’” said the car rental rep, not quite looking at home in a suit and tie. I had to agree. Phoenix no doubt has its attractions, but with only six days in Arizona we’d headed north after one night in Tempe, a suburb near the airport. Phoenix’s urban sprawl leeches north for about an hour’s drive but eventually the two-lane Highway 17 set us among cacti and rolling desert hills on our way to Montezuma’s Castle in Verde Valley. The Disney-sounding name is misleading. 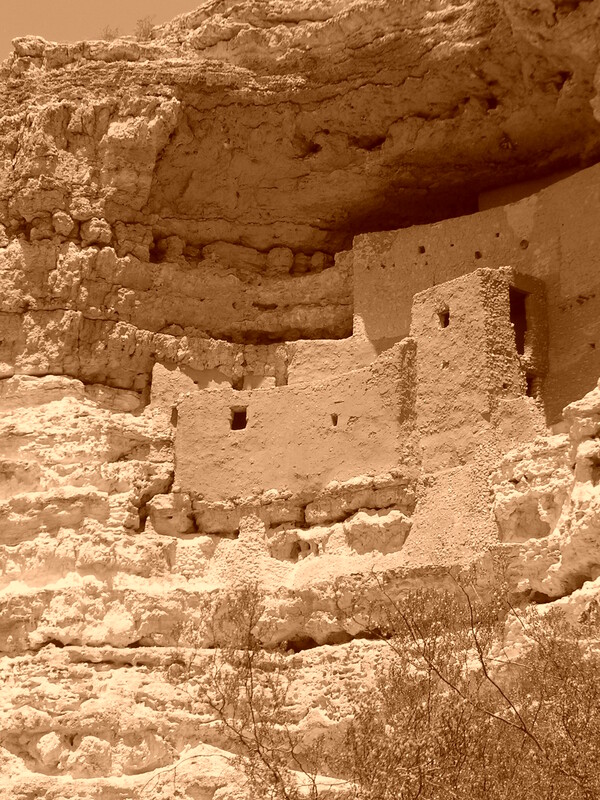 When early settlers first saw the five-storey fortress somehow built into a cave 30 metres up a cliff they assumed it had been built by the Aztecs and called it Montezuma’s Castle. In fact, Sinagua farmers using ladders and gravity-defying courage are now known to have carved out 20 residences in the limestone recess. Support beams – cut from white-barked Arizona Sycamore – are still visible 900 years after the Sinagua erected them. Literally meaning ‘without water,’ the Sinagua culture all but disappeared in the 1400s, likely because of drought or warfare with the rival Yavapai people. Until midway through the last century, visitors could still use a series of ladders for a closer look at Montezuma’s Castle. However, when Highway 17 was completed those visitors became hordes and concerns about safety and damage prompted the U.S. National Park Service to remove the ladders. You'll be glad of the air conditioning at Montezuma's Castle. Despite being treated to the sight of one of North America’s best preserved cliff dwellings, we were constantly distracted by something much more down to earth: lizards. Among the mesquite and saltbush growing around an empty riverbed, lizards were always on the move, but occasionally stopping for photos. We were less hardy. The unrelenting heat beat us back to the car and higher into Arizona’s Black Hills. Thanks to a tip from a friend in Vancouver we found the town of Jerome, a place cool in both senses of the word. Atop Cleopatra Hill, the whitewashed Jerome Grand Hotel – once an asylum to house the mine’s burn victims and TB sufferers – presides over the community. Jerome looks nothing like mainstream America; more like a European citadel. The 15,000 copper miners are long gone and in their place is a thriving artist community of about 450 people. Which could explain the presence of so many great places for coffee. The café cubano (an espresso shot sweetened with sugar as it’s brewed) at Jerome’s Flatiron Café was the best java jolt I’ve ever tasted. On a clear and chilly August evening we lined up for an hour to take a turn peering into the heavens through the same 61-centimetre telescope erected by Percival Lowell in 1894 and used to find Pluto 36 years later. Even to the naked eye, the glowing red of Jupiter was hard to miss and once inside the old wooden observatory dome we were treated to a glimpse of the Wild Duck Cluster — an estimated 2,900 stars seemingly confined to a few small inches of the sky and thought to be 200 million years old. Daytime revealed more down-to-earth pleasures in Flagstaff and with the NFL’s Arizona Cardinals conducting preseason training at the town’s Northern Arizona University Campus, hundreds of crimson-clad fans flooded the historic core’s coffee shops, restaurants and brewpubs. Coffee was outstanding at the downtown Hotel Monte Vista, where scenes from the movie Casablanca were shot, and the sushi at Karma was worth the trip. B.C. travellers might also appreciate the fact that pubs here welcome children. For all the attractions and distractions off Arizona’s beaten track, naturally it’s hard to compete with the Grand Canyon. A jeep tour in Sedona came close though. About 80 kilometres south of Flagstaff, the town of Sedona lurks within rust-red monoliths and mesas. With a reputation as a spiritual mecca, Sedona is home to about 11,000 people, most of whom came from somewhere else. Steve Williamson came from New York City with his wife who wanted to be anywhere but the Big Apple after helping with 9/11 relief efforts. A geology major and web designer, Steve is in his element working for Red Rock Western Jeep Tours; contorting a so-called iron pony up, down and over impossibly steep and rugged desert trails while spinning yarns about the area’s history, culture and topography. Following part of the trail built by General George Crook’s soldiers in 1871-72 and surrounded by Soaptree Yuccas, Prickly Pear plants, Pinion pines and Utah junipers, Steve put names to much of what we had seen on our travels through northern Arizona. Seemingly oblivious to boulders, potholes and our occasional screams, Steve regaled us with tales of Crook’s Apache campaign and made sense of Sedona’s dramatic landscape. 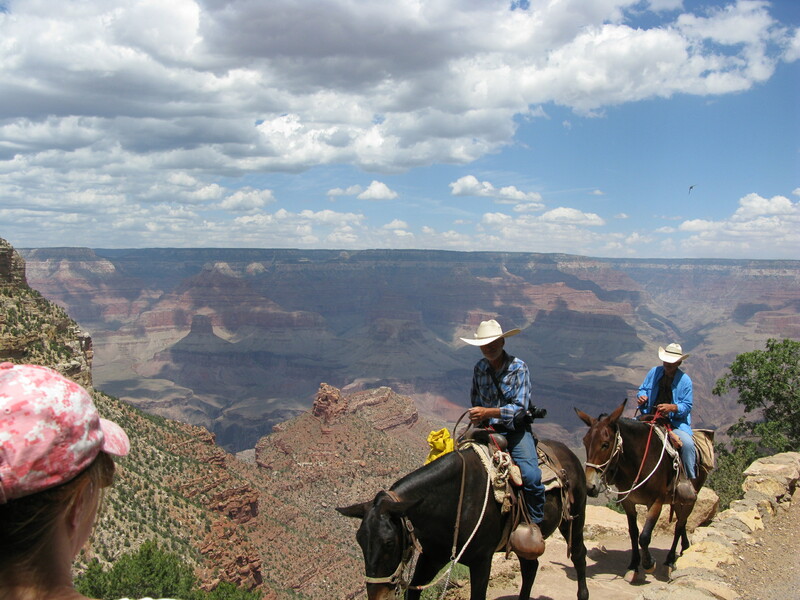 But even Steve might struggle with the trails of the Grand Canyon where rented mules are the fastest mode of transport. We stuck with our own two feet and hiked about 15 kilometres over two days. We descended Bright Angel trail into the Canyon and felt the temperature rise with every narrow switchback. We also strolled the extensive network of trails along the south rim, watching bleached white clouds cast their shadows on an otherworldly landscape. By all means buy a souvenir at Verkamp’s Visitor Centre, a drink at the El Tovar Hotel or dinner at the Thunderbird Lodge, but don’t be distracted from the main event. Put your camera down and take at least a few moments of solitude and silence here. The Grand Canyon is 446 kilometres long, up to 29 kilometres wide and 1.6 kilometres deep. For those who are prepared to get a little dirt under their fingernails and some sweat on their backs there are memories to last a lifetime. How the Judd family managed to obtain such a prime viewing spot must remain a secret. It's not exactly the stuff of gladiators, but cycling Rome will still get your adrenaline pumping. You think skydiving is exciting? 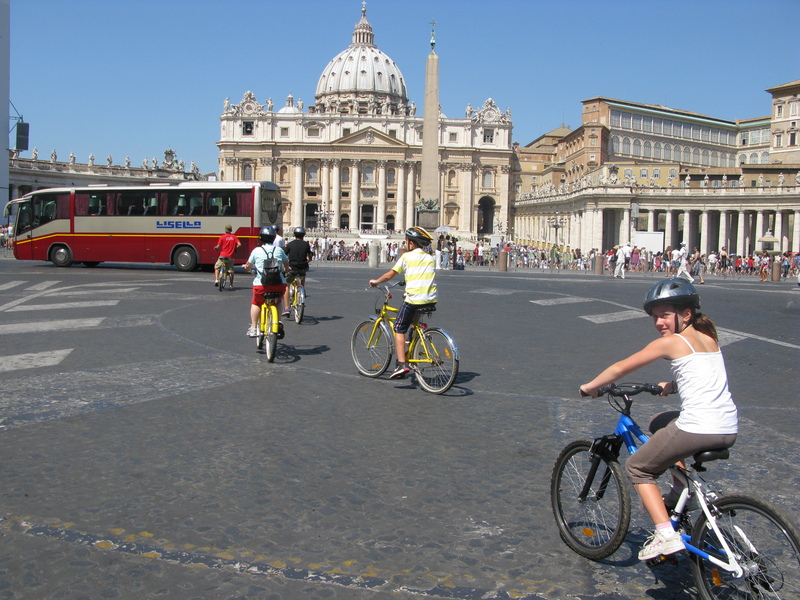 Try riding a bike through Rome for four hours: With your kids. Roman motorists probably tend to think of cyclists as ‘another hurdle’, which may explain why we saw so few bicycles during the two days we were there. But with less than 48 hours in Rome, a bike tour made sense. Riding plugs you into a city’s arteries and its heartbeat. When those arteries get as clogged as Rome’s, two wheels keep you moving and come with a breeze — more than welcome in 35-degree heat. Empire. Over the course of six centuries, half a million people are estimated to have lost their lives fighting in the Colosseum. “Sometimes it would be flooded to stage water battles,” Roberto told us. My mind wandered to Russell Crowe, gladiators, executions and exotic animal hunts. “Wouldn’t it be great if they converted it into a soccer stadium,” said my son Ryan. “Vancouver library looks like that,” said my daughter Emma. Watching the hordes sweat in lineups to enter the Colosseum only made me happier to push on, following closely behind Roberto as he sailed past tour buses and taxis to Circus Maximus. This used to be the largest man-made venue in the world. Where did everything go? 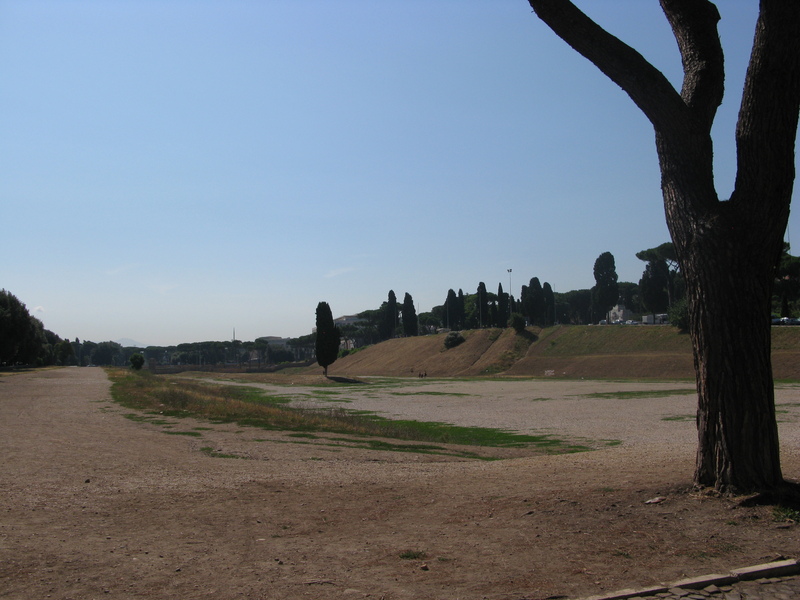 Considering it was the greatest arena ever built, once accommodating 330,000 people, Circus Maximus today is an anticlimax. Dog walkers and joggers use the greenery where chariots once thundered. The only evidence of the venue’s illustrious past is the spina, a raised median in the middle of what was once the racing track. The venue between the Aventine and Palatine hills still serves as a useful meeting place for Romans. More than 700,000 of them gathered here to celebrate Italy’s soccer triumph in the 2006 World Cup. And those who weren’t there packed Campo dei Fiori, where we cycle a little later. “It was chaos in here … anarchy” said Roberto, recalling the night Italy beat France on penalty kicks. Roman Renaissance splendour and the home of the French embassy. Rome. Thankfully graffiti is harder to spot in Piazza Navona, a square so beautiful cyclists tend to spontaneously dismount. Emma walked off to watch sketch artists at work while the rest of us sat and gazed at the Fountain of the Four Rivers, Gianlorenzo Bernini’s Baroque Roman masterpiece. Four Gods frame the centrepiece of the fountain, the Obelisk of Domitian, which is crowned with a dove. They represent the Nile, Danube, Plate and Ganges, the world’s known major rivers in 1651 when Bernini created the landmark. What little shade cast by the Obelisk had been taken so we admired the Gods, all sinew and marble menace, while cooling our wrists in the water. Moments later we were back on our bikes slaloming between pedestrians ambling through Piazza Navona. The more we cycled the more comfortable we became navigating traffic. Perhaps it’s the raised saddle of a cruiser bike, but we couldn’t help feeling somehow superior to the other tourists trudging along baked cobblestones. 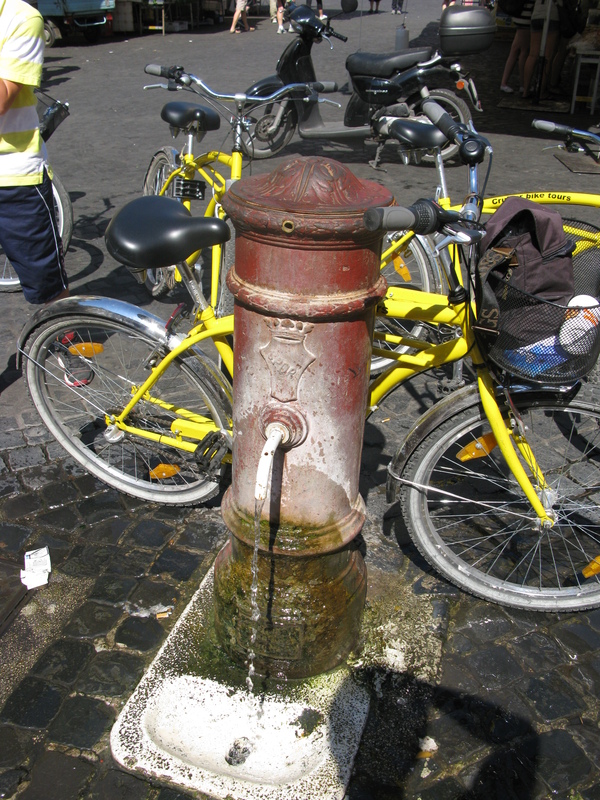 Water fountains are everywhere in Rome. So is the graffitti. 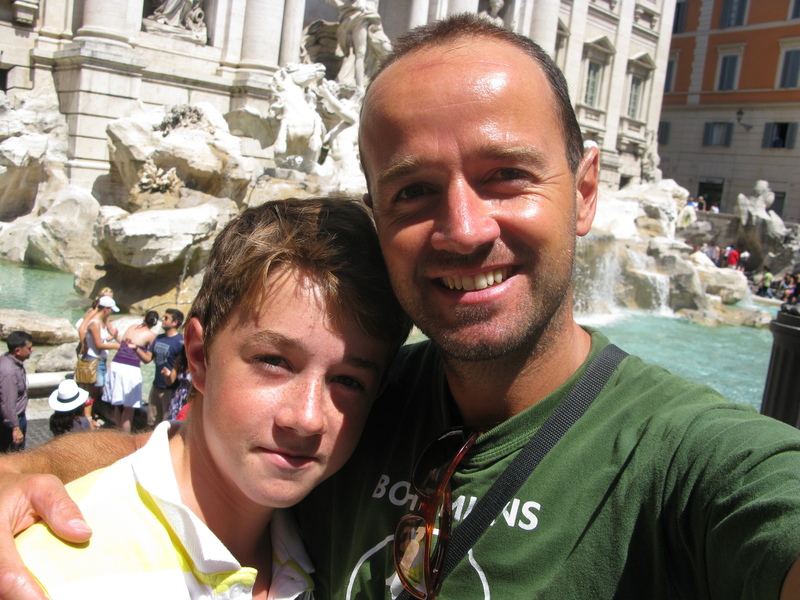 seemingly half the world’s tourists would besiege one of the world’s most famous fountains. An estimated 3,000 euros are thrown in the fountain each day and anyone thinking of diving in to steal ready cash had better be prepared for a slow getaway. It’s easy to see why so many people come: Almost 26 metres high and 20 metres wide, the Trevi Fountain is hard to ignore, especially with Neptune, God of the sea, taking centre stage on a chariot pulled by rampant horses. But it’s also hard to linger, surrounded by so many people, who probably all feel the same way. Stopping for another drink might have been sensible thing to do. Roberto had other ideas. Not far from the chaos of the Trevi Fountain is Giolitti. In a city full of gelateries, Giolitti stands out for one simple reason. It has more than 100 flavours to choose from, and some of the recipes are almost a century old. The Coppa Giolitti, which combines chocolate ice cream, custard, chilled zabaione, and is topped with cream and hazelnut shavings, has been responsible for ice cream headaches since 1920. For cyclists young and old, the restorative powers of ice cream cannot be underestimated, especially when it comes in flavours like Nutella, English Trifle, kiwi and Kit Kat. Second best might have been us cycling along the Tiber River, past the imposing cylindrical fortress Castel Sant’ Angelo and up Via della Conciliazione to St. Peter’s Square. the taxis and countless buzzing scooters, we drank from a water fountain and watched the world go by. It may have been chaos, but it was beautiful chaos. Visit http://www.italysegwaytours.com for details about tours of Rome. Hard to believe 5,000 tourists are two feet from Ryan and I.